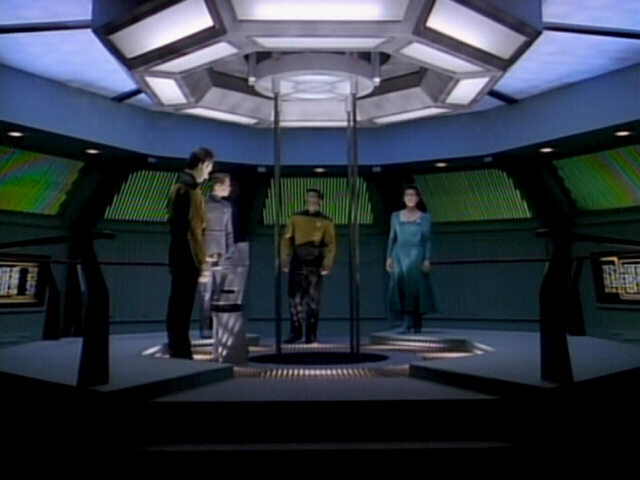 Ex Astris Scientia - Observations in TNG: "The Drumhead"
Observations in TNG: "The Drumhead"
Here are some observations about sets, props and visual effects in TNG: "The Drumhead" without a specific theme, and a comparison of the original TV release (TNG) with the remastered episode (TNG-R). 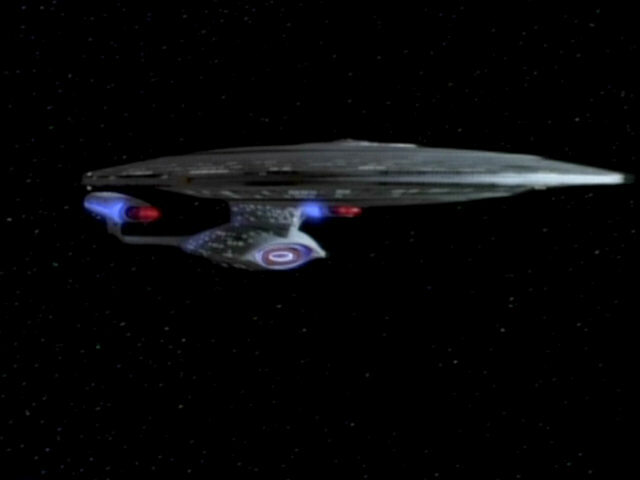 A shot of the USS Enterprise-D in space. 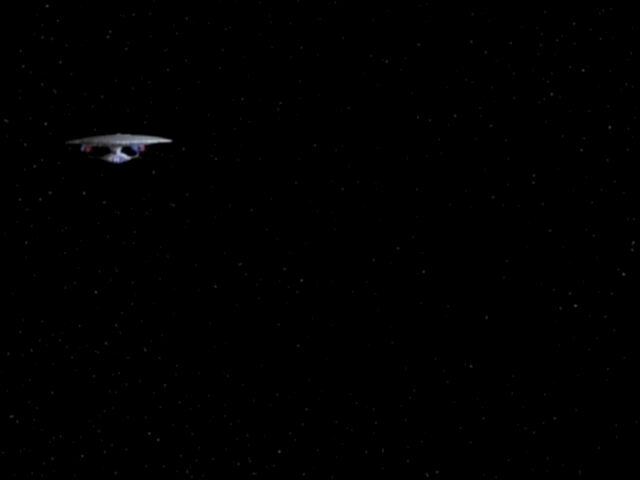 Enterprise Flybys in TNG and TNG-R This very long shot had to be replaced with a CG model of the ship for the remastering as the original footage could not be located. 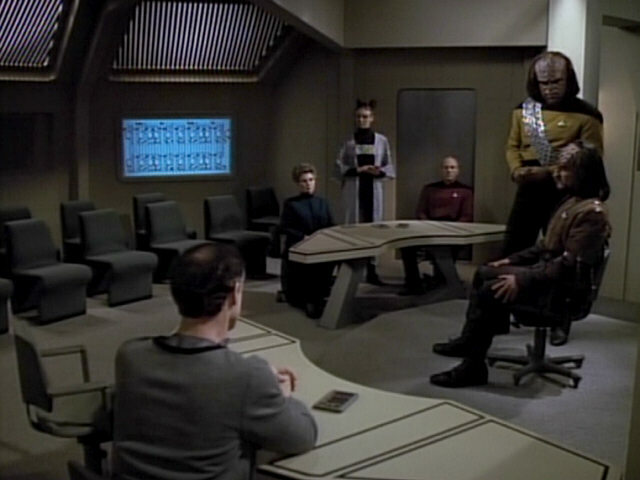 The interrogation room appears for the second and last time after "The Defector". 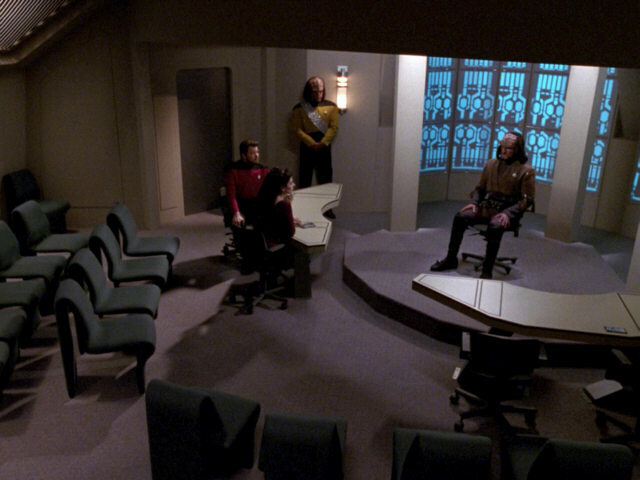 In that episode, the room was much smaller than here. 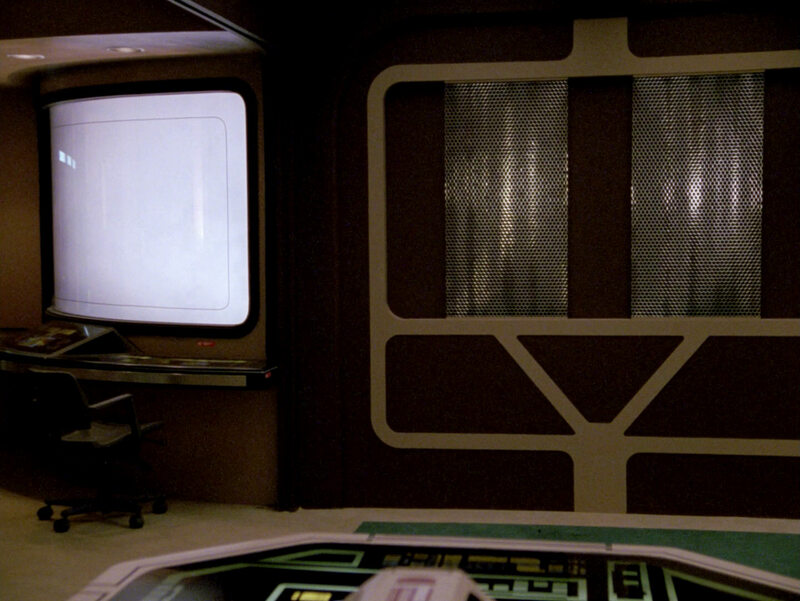 It can be seen here that half of the set consists of the original USS Enterprise bridge set from the first four Star Trek films, which was later re-used as countless other sets on TNG, including the courtroom in "The Measure of a Man" and the cybernetics lab in "The Offspring". 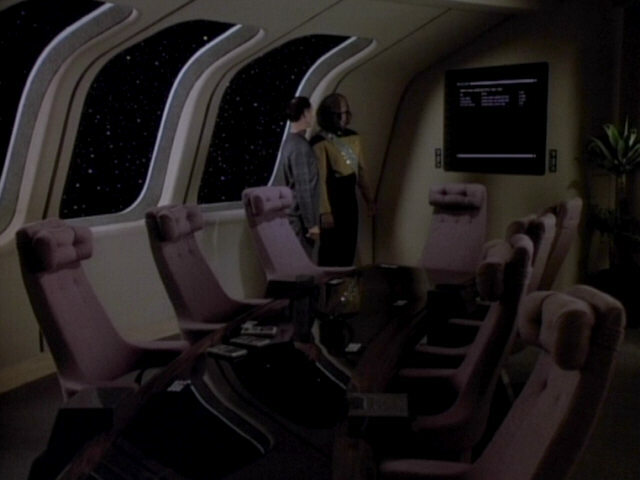 Re-Used Starship Interiors A good look at the room in TNG-R. 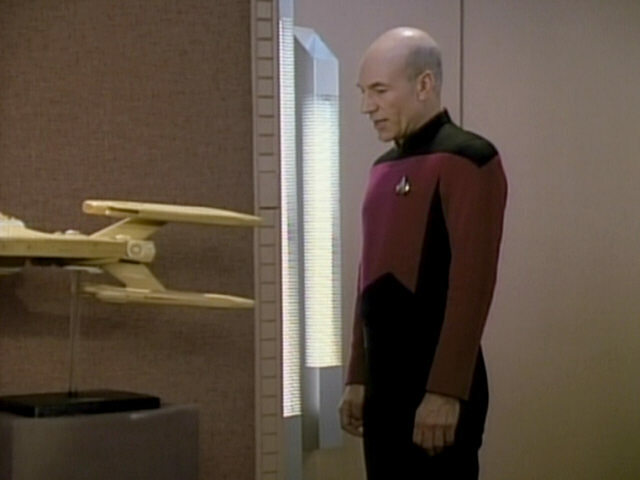 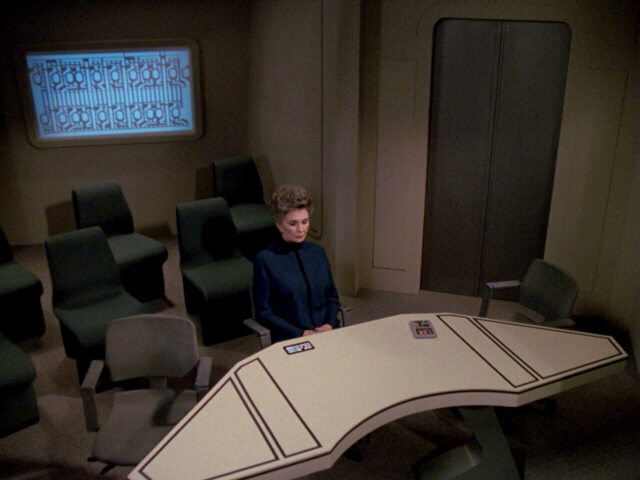 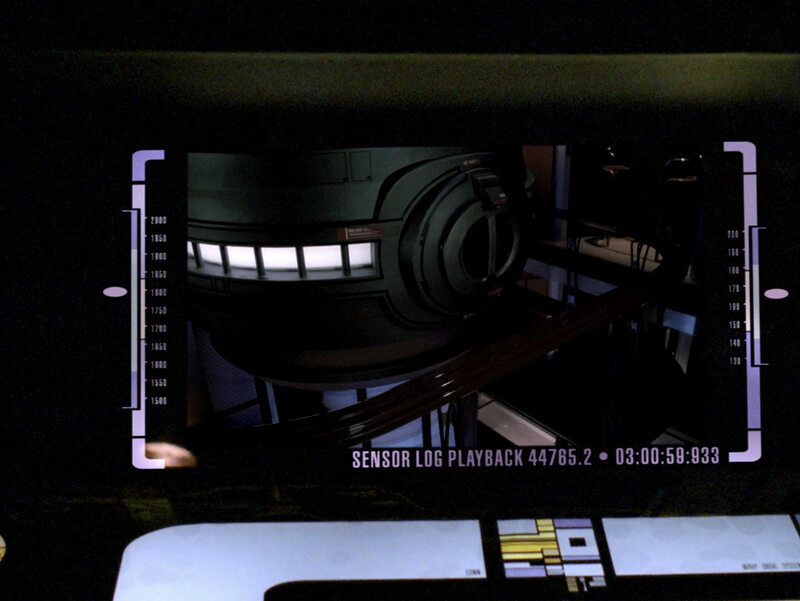 The location of the junior crew quarters replicator (installed for "Data's Day") was modified for this episode. 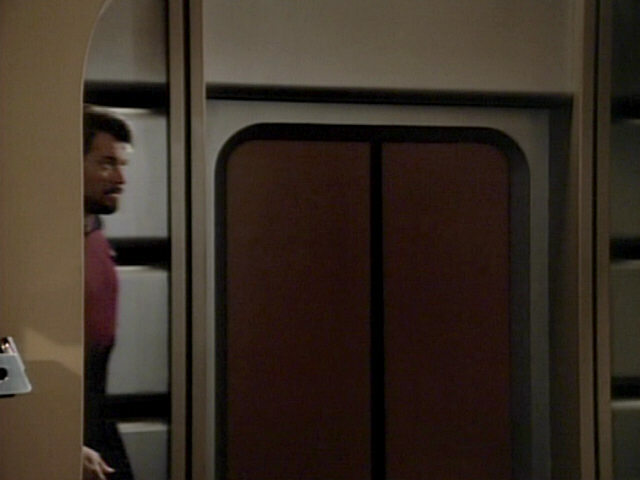 It is located much closer to the door now. 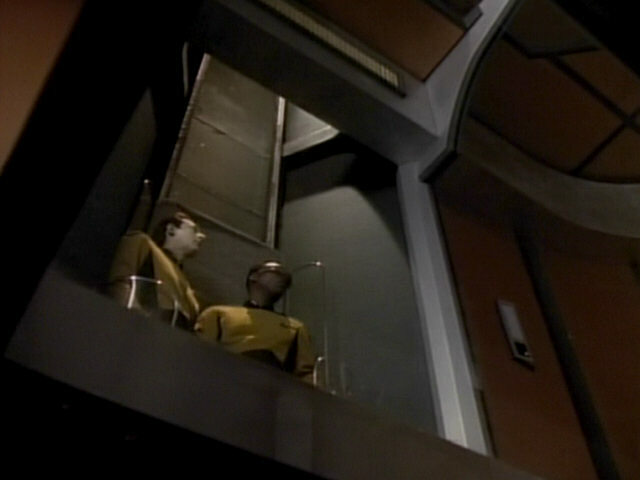 It also seems a second wall, with an angled doorframe instead of a rounded one, was attached to the original wall. 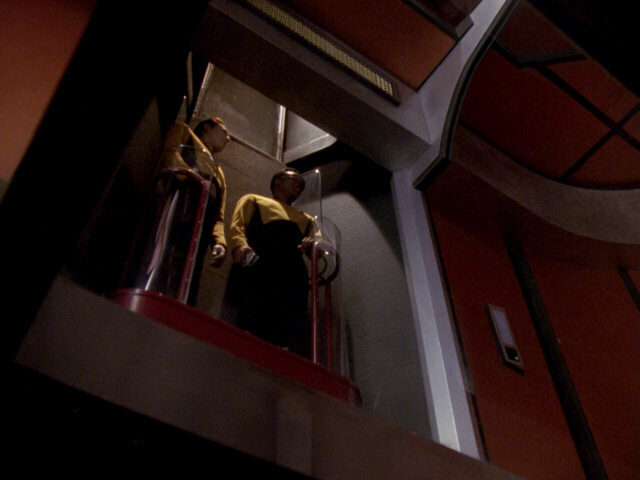 This covers all of the paneling of the original wall and actually makes it possible to attach the replicator closer to the door. 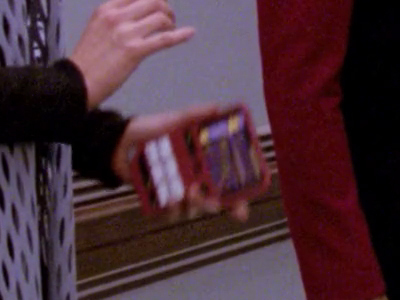 The screenshot from "In Theory" shows that this change was still in place a few episodes later. 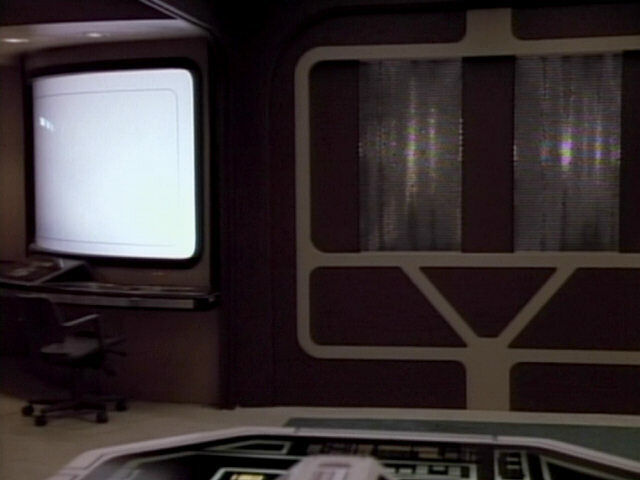 Screenshots from "Galaxy's Child" and "Night Terrors" show what the wall looked like before. Why was the set modified like this? 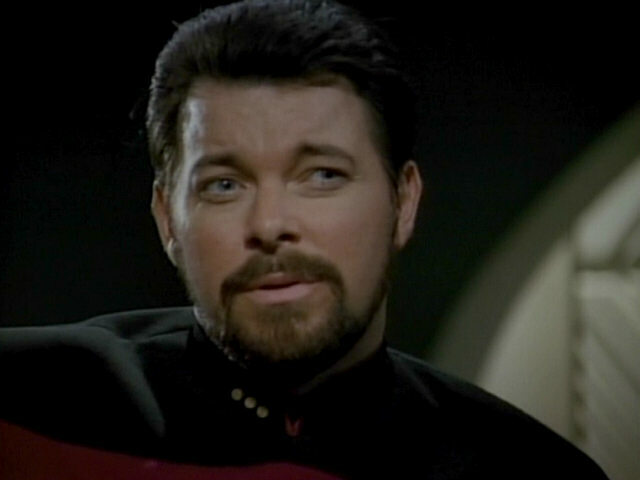 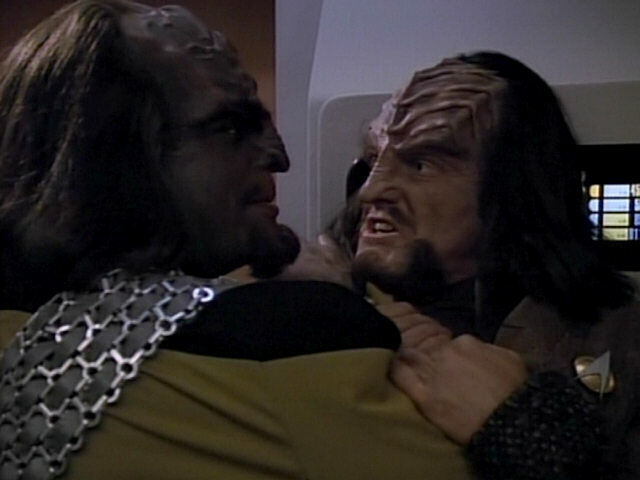 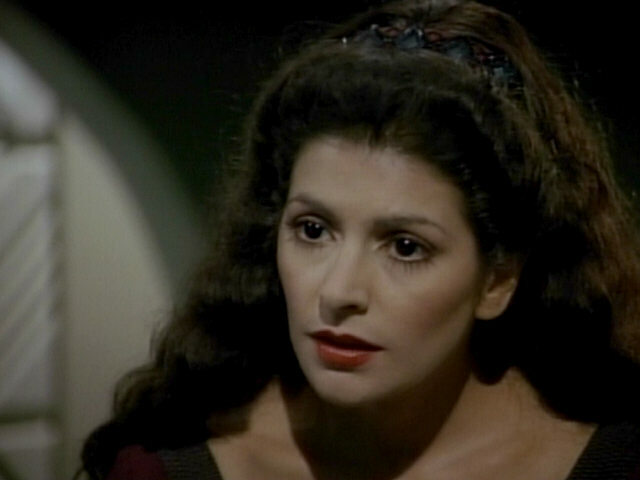 Most likely to allow Worf to slam J'Dan into the wall like he does in the scene in "The Drumhead". 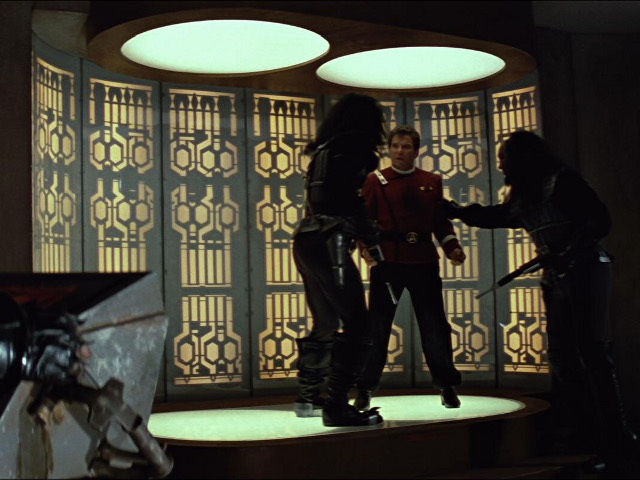 Maybe the replicator originally was located too far away from the door or the unevenness of the wall didn't allow the scene to be filmed as required. 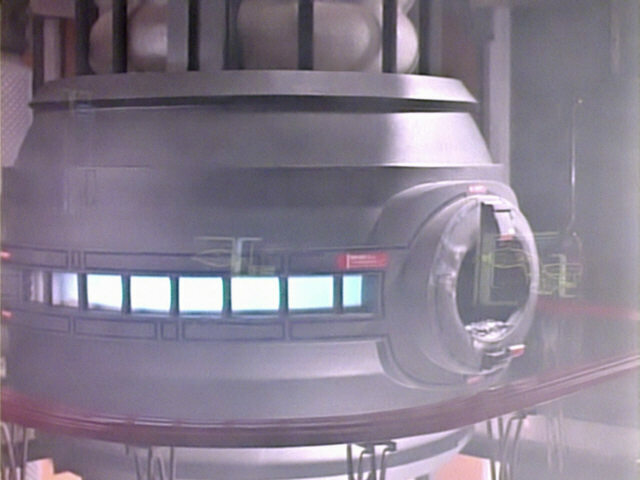 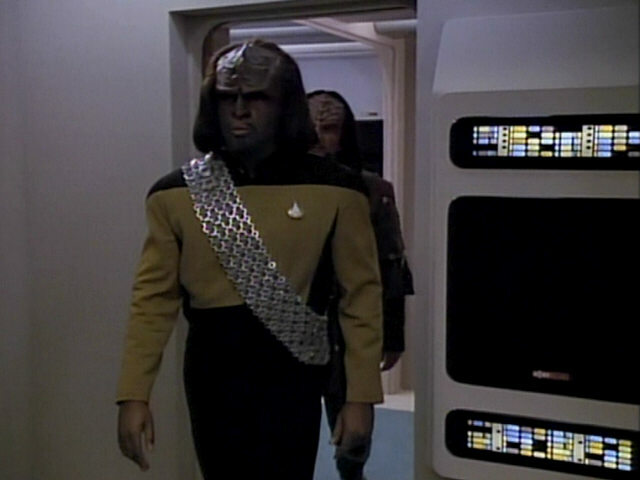 "Galaxy's Child" The replicator in TNG-R. 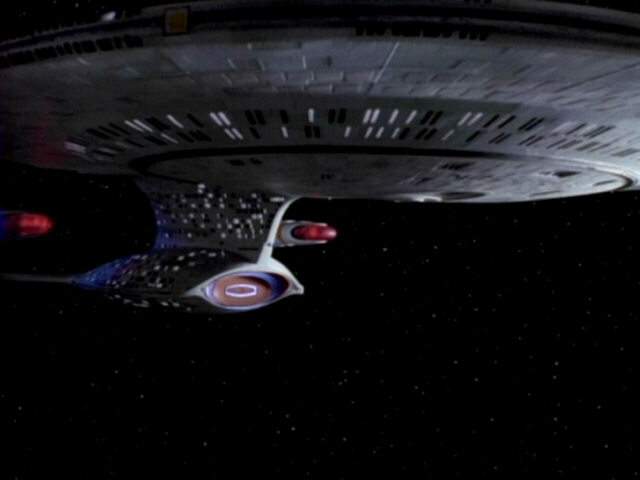 The registry (NCC-59318) of the Oberth-class vessel USS Cochrane can be clearly seen in this shot, while the name of the ship cannot be read. 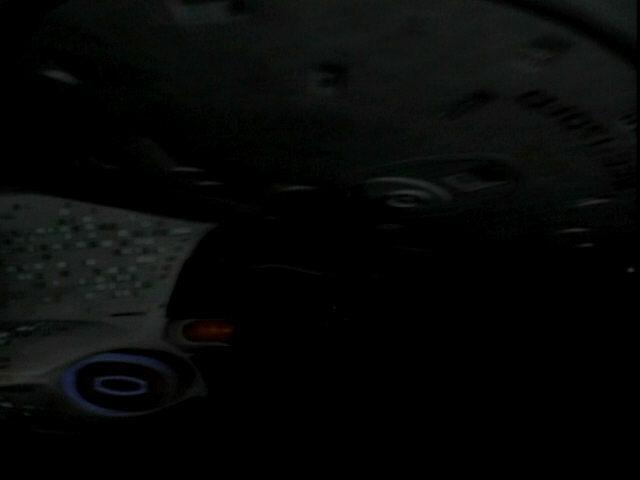 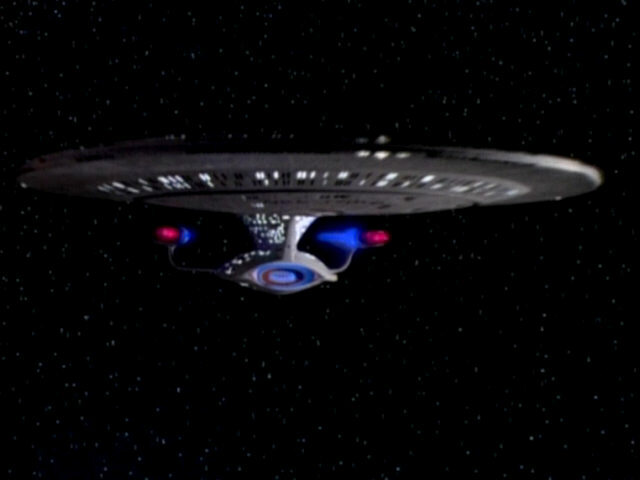 This footage, first focusing on another ship and then slowly moving towards the USS Enterprise-D, was originally created for "The Most Toys", where the camera first focused on the Jovis. 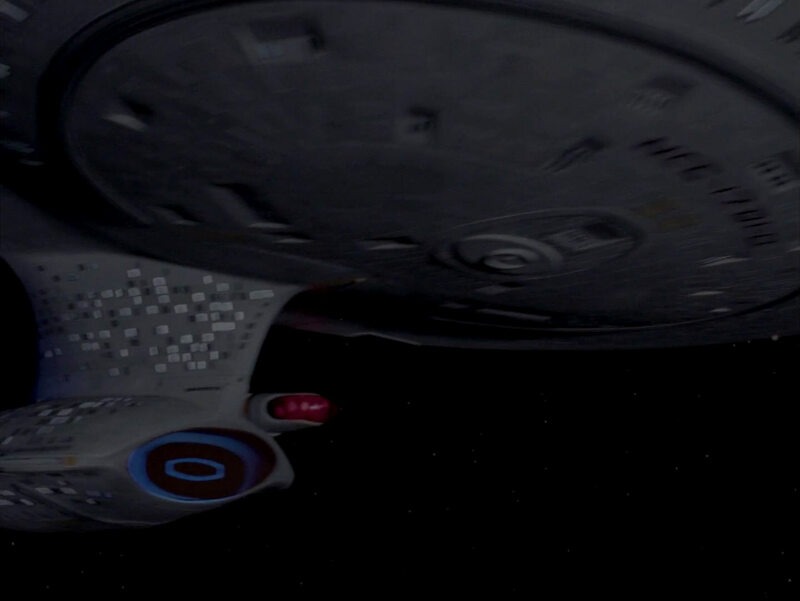 "The Most Toys" The HD shot allows to recognize many more details on the Oberth-class vessel. 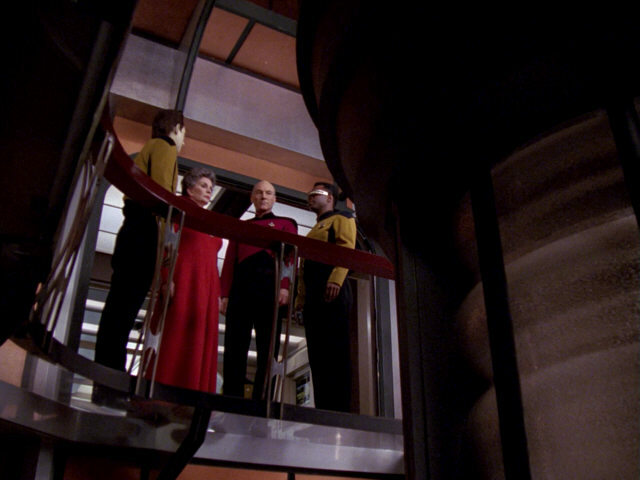 Due to the warp core breach, the inner isolation door has come down, still giving access to the chief engineer's office. 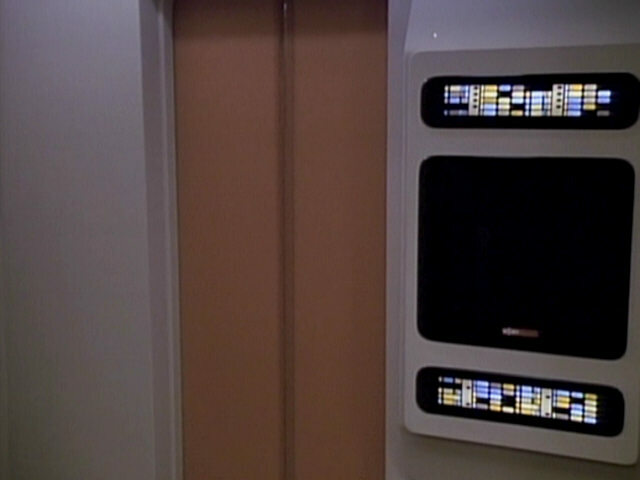 In all other episodes when an isolation door is seen, like in "The Best of Both Worlds I", the outer door comes down. 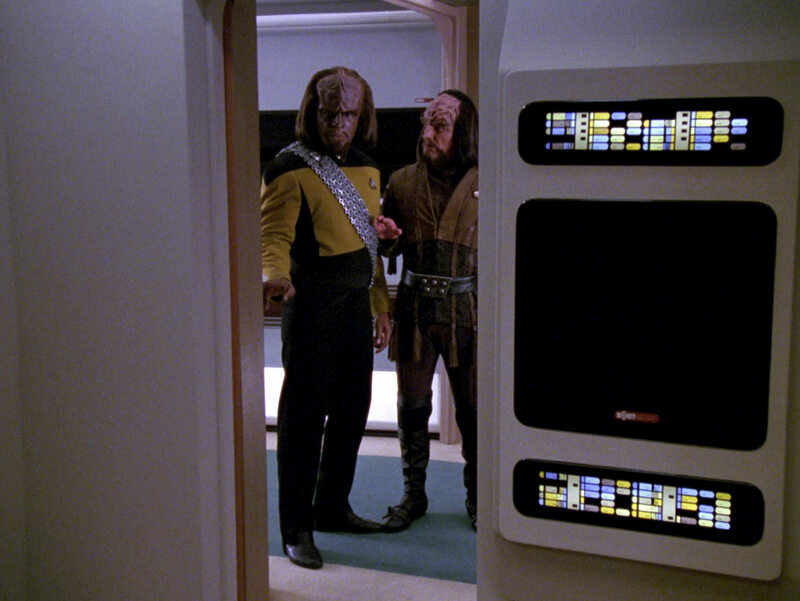 Both Worlds I" We can recognize the texture of the metallic wall inset much better in HD. 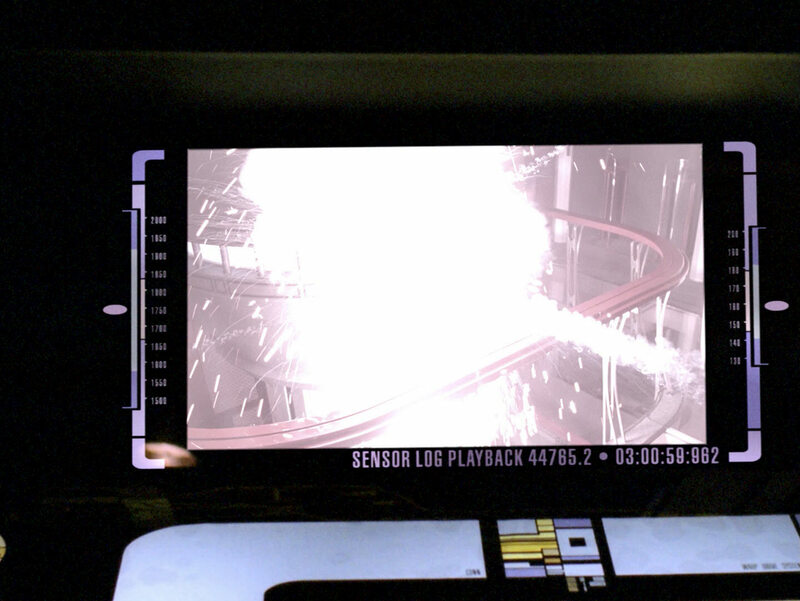 Footage shows the explosion in the dilithium chamber. 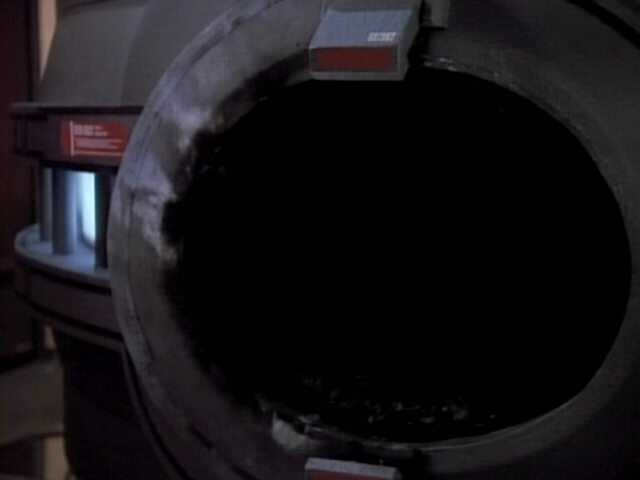 The sequence was newly composed for TNG-R.
A close look at the destroyed dilithium chamber. 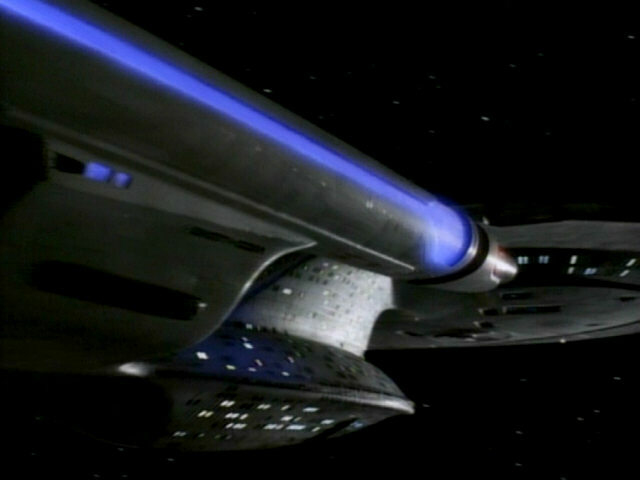 When the episode was remastered, the original film element seen here could not be located so the SD footage was used instead. 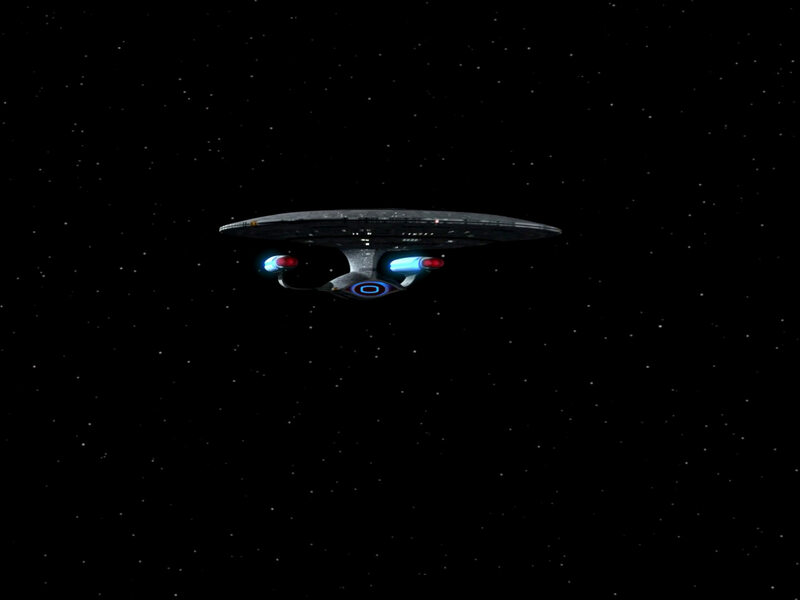 This footage of the USS Enterprise-D first appeared in "The Nth Degree", where it shows the ship slowly drifting away from the Cytherian probe, only backwards. 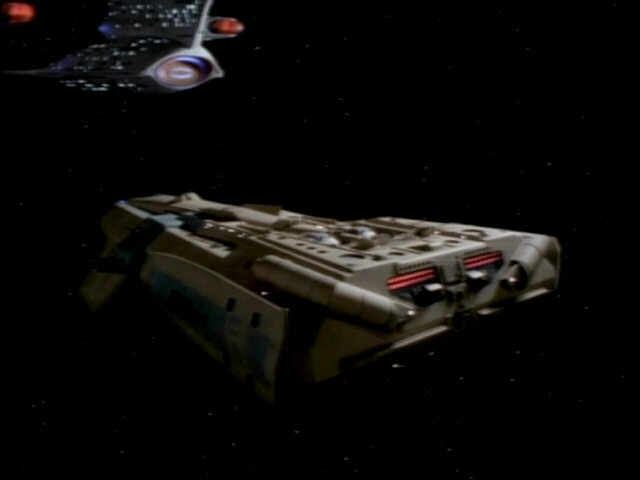 Here, the footage was used backwards, so the ship slowly approaches the camera and gently turns to the left. 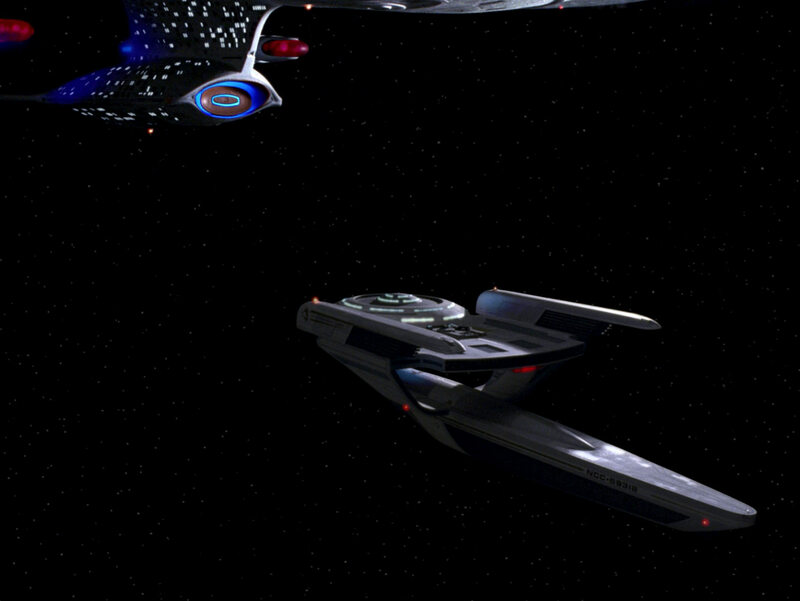 "The Nth Degree" The shot of the ship in HD. 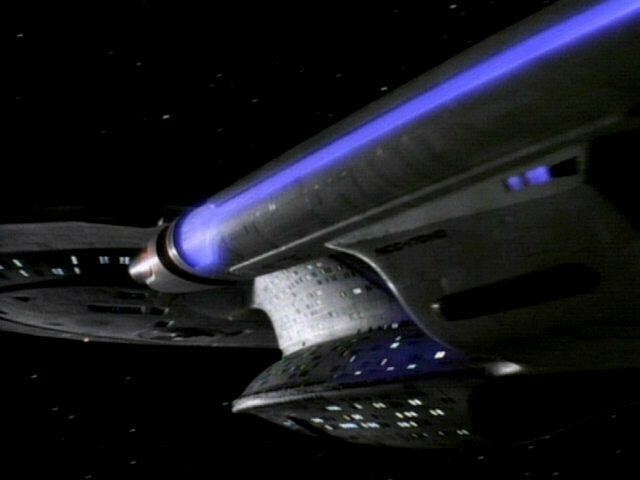 The aft section of Picard's Constellation-class model can be seen well in this screenshot from the episode. 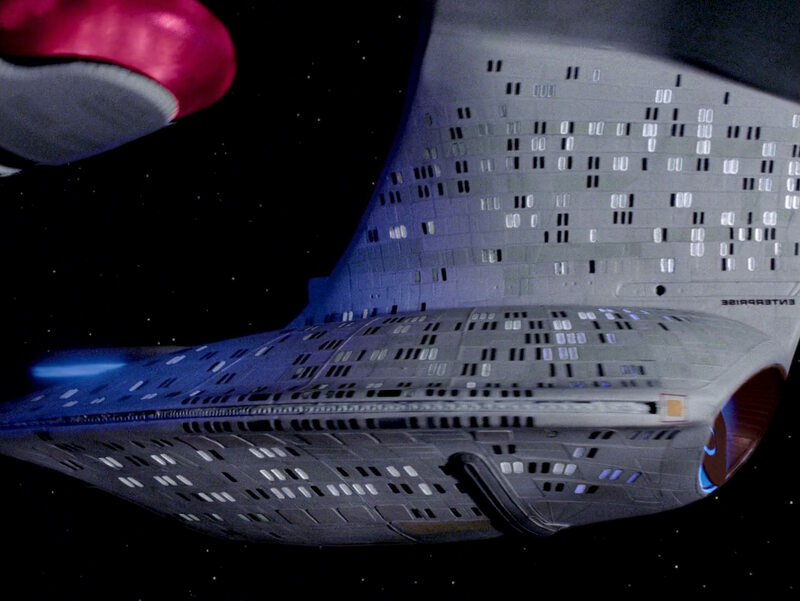 A better look at the ship model in HD. 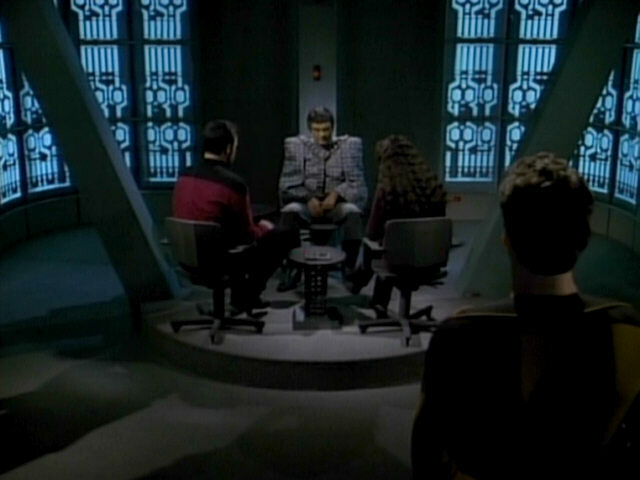 While the smaller section of the interrogation room, featuring the blue walls and the interrogation chair looks similar to its earlier appearance in "The Defector", it can be seen that this part of the set was changed as well. 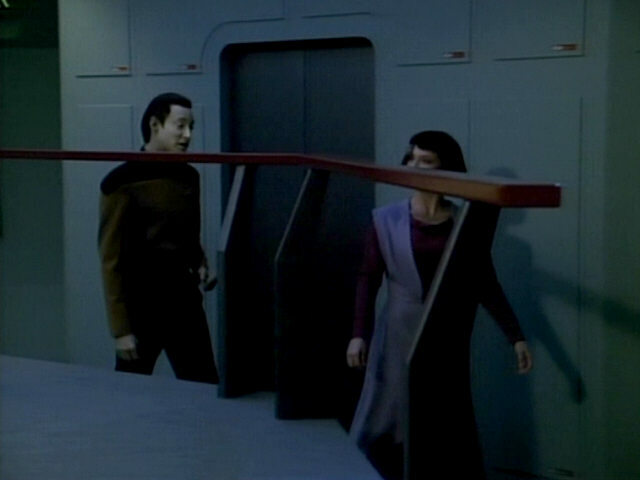 In that episode, the two curved sections of the wall were not located as close to each other and diagonal struts were part of the set. 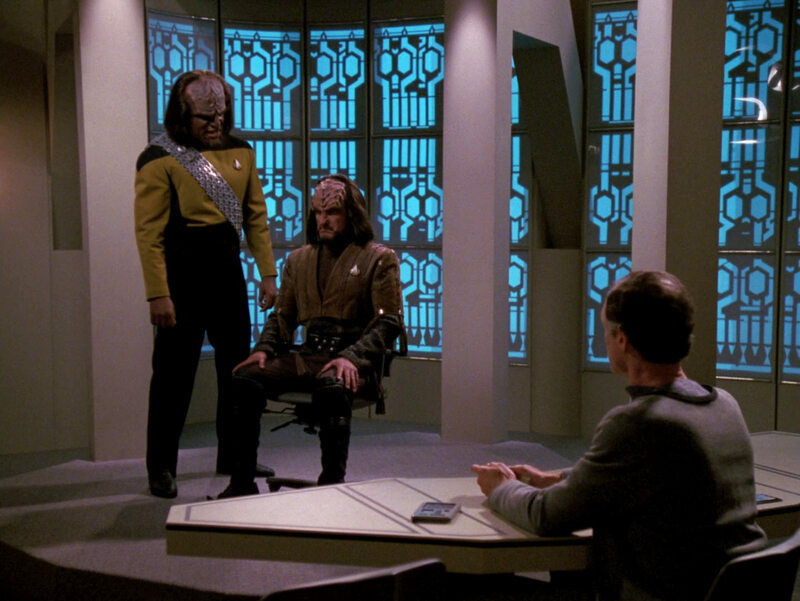 "The Defector" The shots of the interrogation room as it looks in TNG-R. 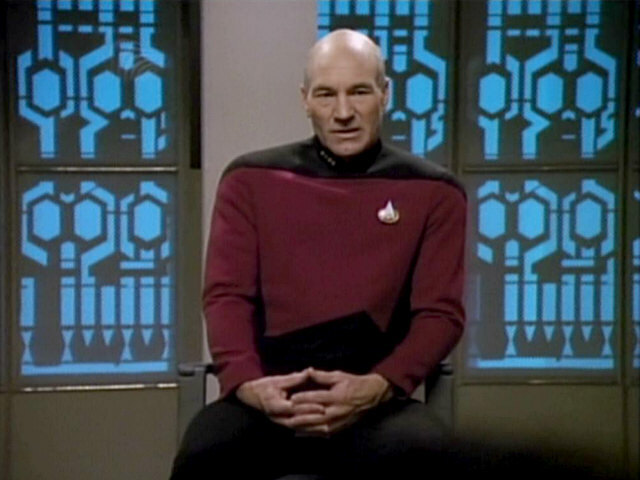 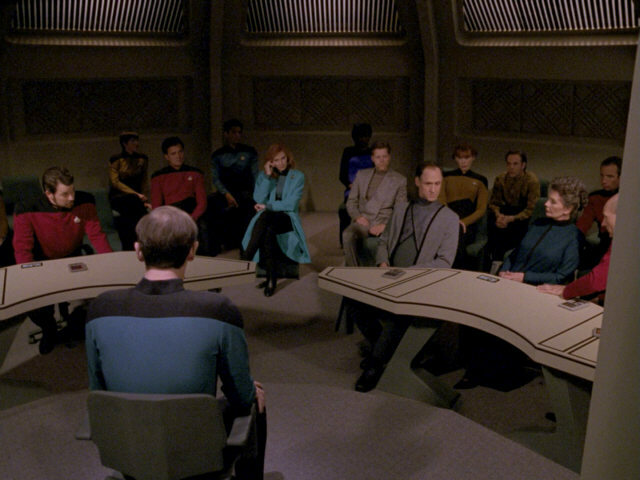 In this shot, it is very apparent that the interrogation room in this episode is a redress of the USS Enterprise bridge set as it later looked on TNG, for example in "Peak Performance" (the bridge of the USS Hathaway) and "The Offspring" (the cybernetics lab). 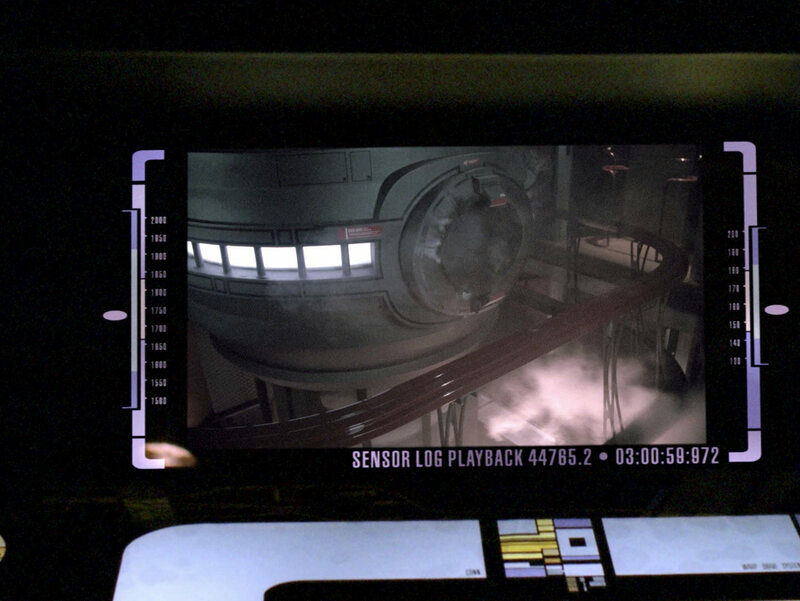 The text displayed on the observation lounge monitor in this scene cannot be read in SD. 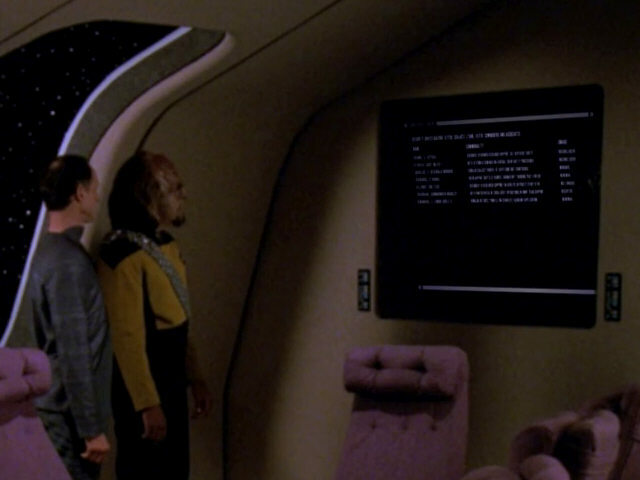 We can't read the text in HD either. 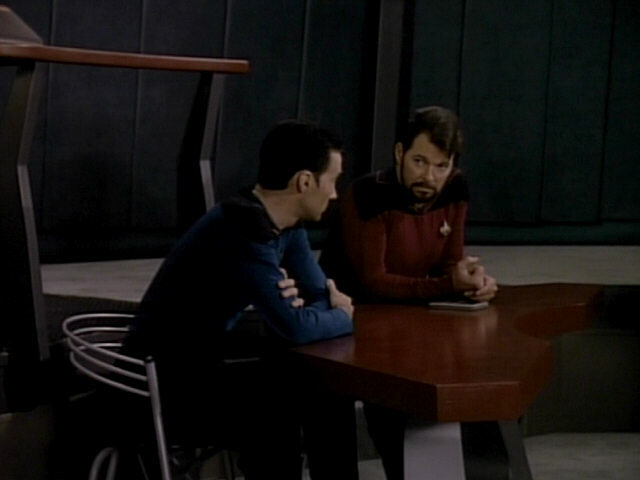 Another look at the interrogation section of the interrogation room. 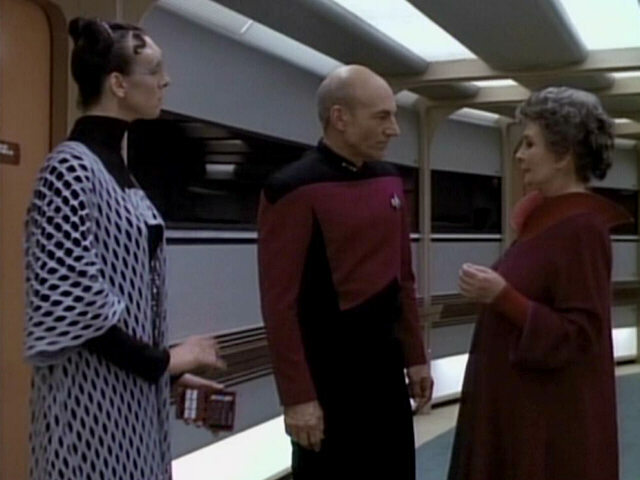 As already mentioned in the "The Defector" article, the pattern on the walls in the background is interesting, as it has been seen before. It was seen on the inner and outer part of the Aldean energy core in "When the Bough Breaks" and also adorns the back wall of the Klingon transporter room aboard Klaa's Bird-of-Prey in "Star Trek V: The Final Frontier". 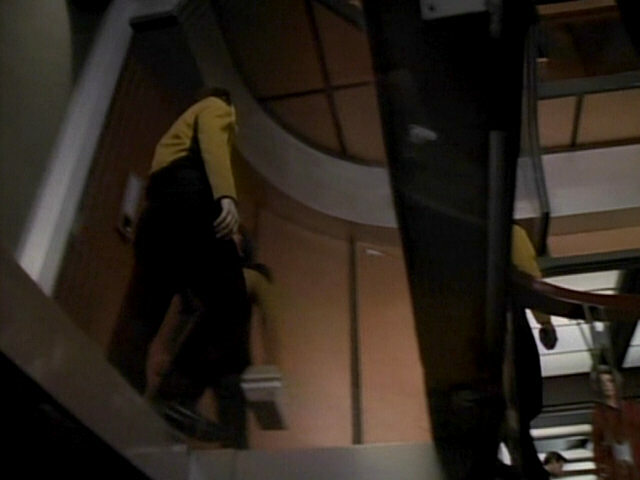 A rare shot of main engineering filmed from the lowest level of the set. 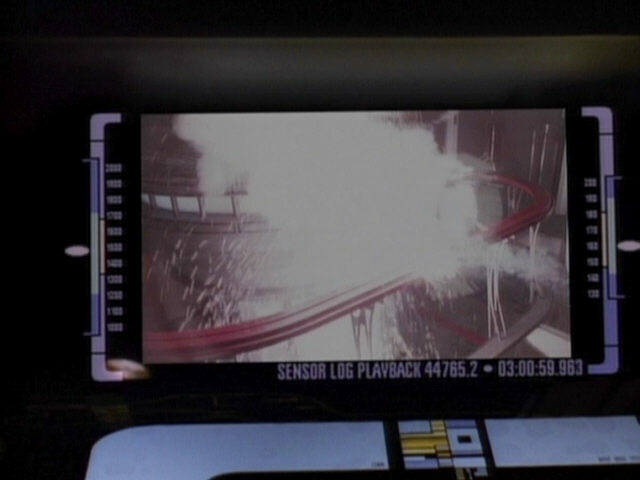 The set as it looks in TNG-R.
A close-up of the destroyed dilithium chamber. 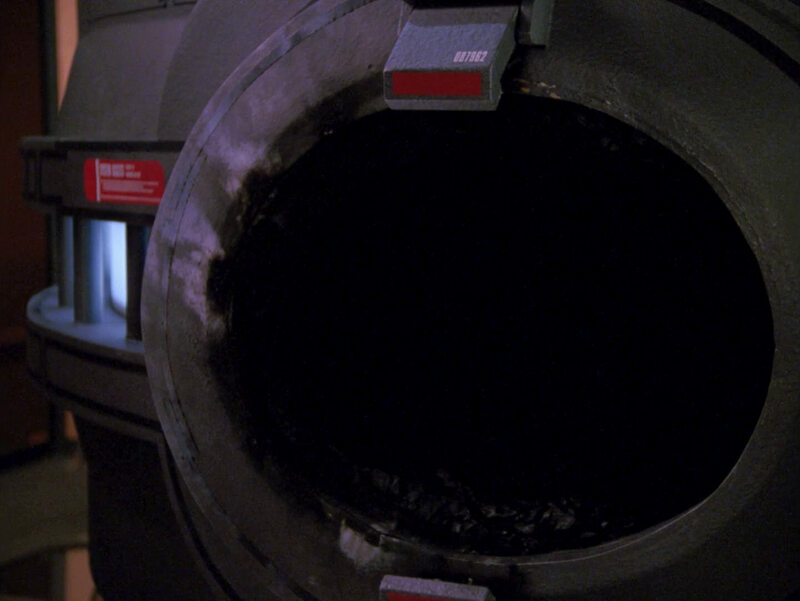 A look at the dilithium chamber in HD. 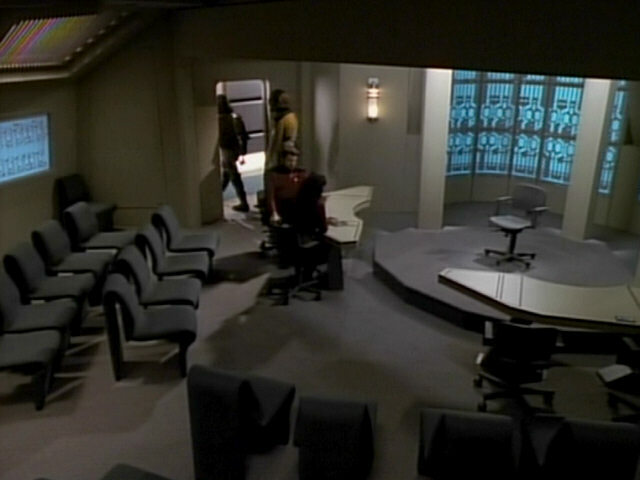 This shot illustrates the full extent of the interrogation room and the fact that it is a redress of the USS Enterprise bridge. 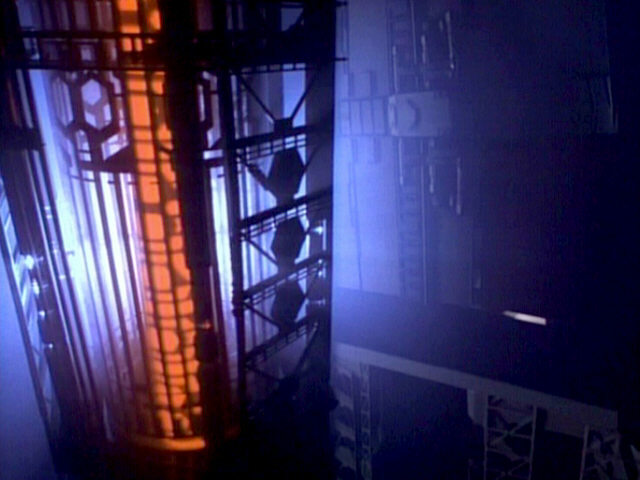 The back wall still looks very similar to how it did in "The Measure of a Man" and "The Offspring". 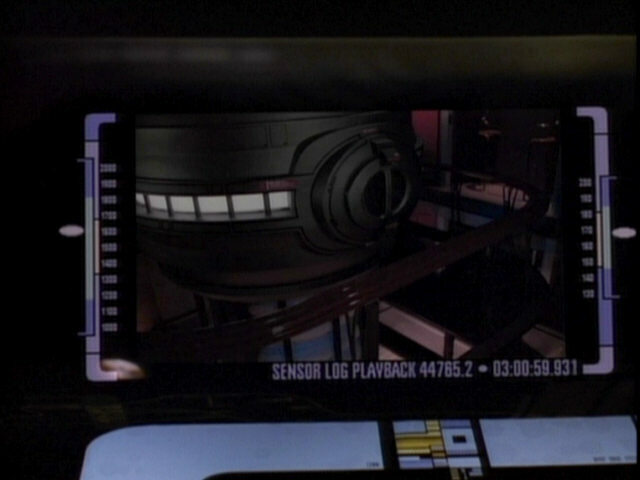 In "The Defector", the set looked different, as the brig was redressed to serve as this part of the set, as can barely be glimpsed in the two screenshots from that episode. 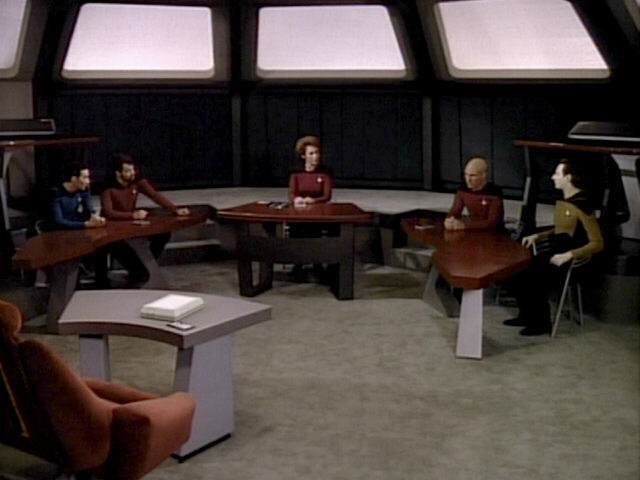 "The Defector" The set as it looks in TNG-R. 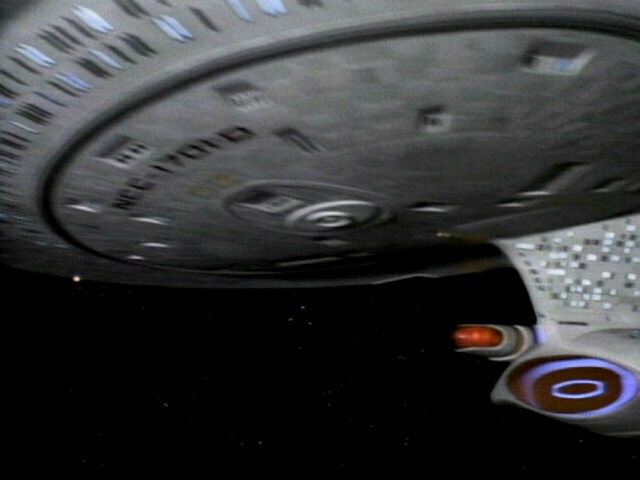 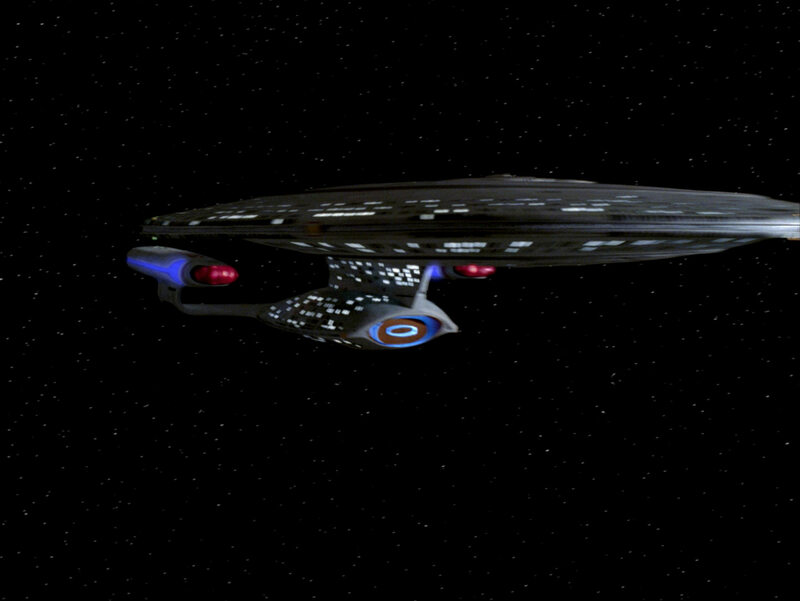 This shot of the USS Enterprise-D flying past the camera was seen in numerous episodes of TNG. 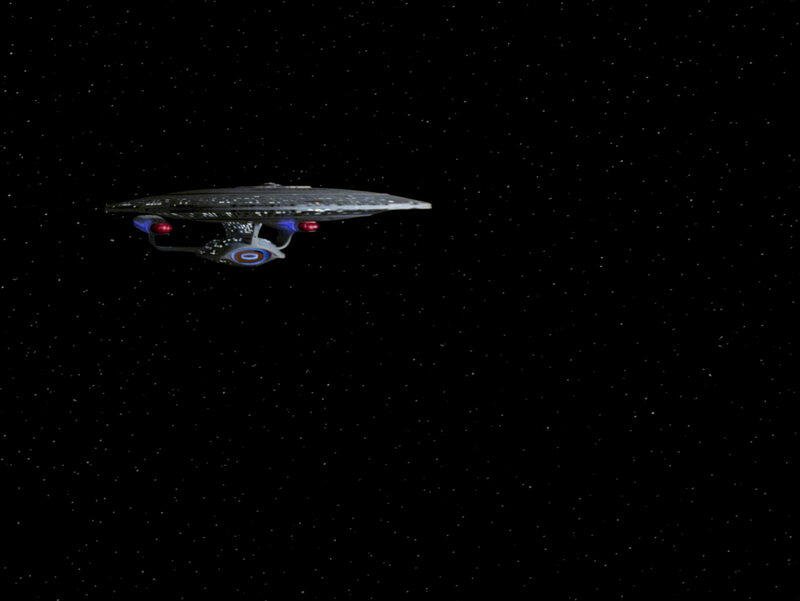 This is the first time, however, that is was flipped, so the ship flies from the left to the right here. 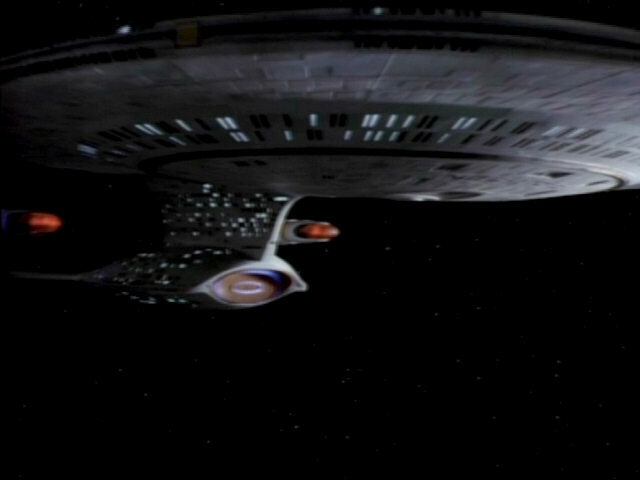 In SD, the inverted registries on the underside of the saucer section, on the side of the stardrive section and on the nacelle strut are not really noticeable. 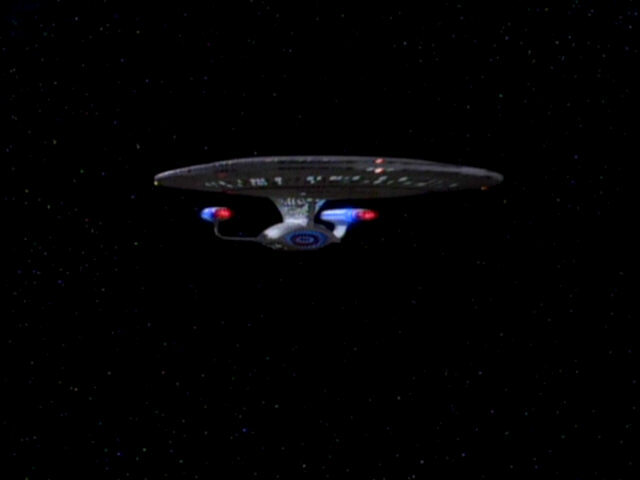 "The Nth Degree" In HD the flipped lettering is noticeable. 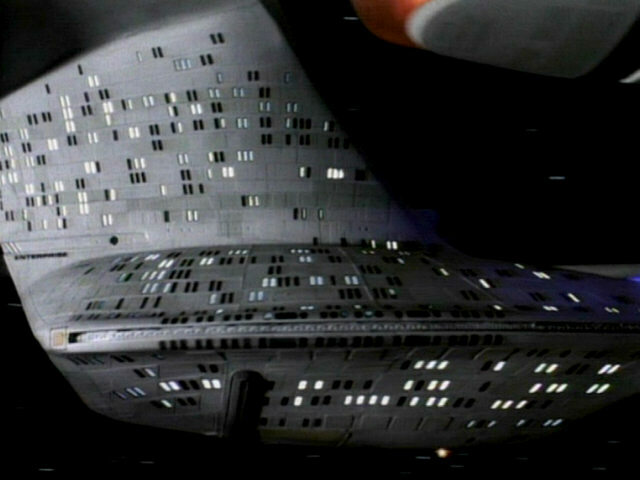 Curiously, only the ship's registry on the underside of the saucer section was fixed, even though it appears for only a few frames during a fade-in. 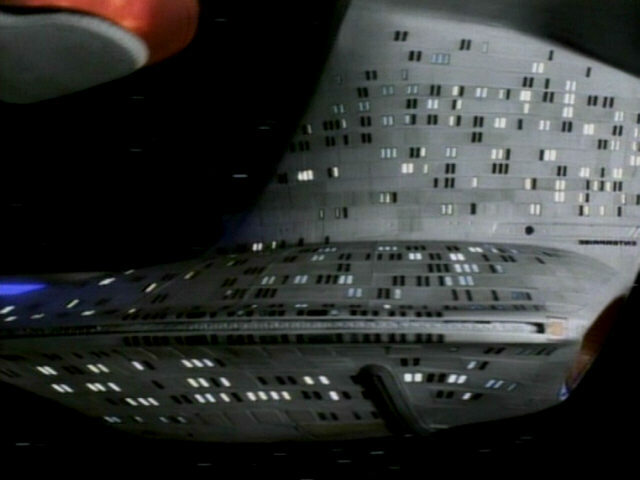 The registries on the side of the ship still are mirrored in the HD version of the episode. 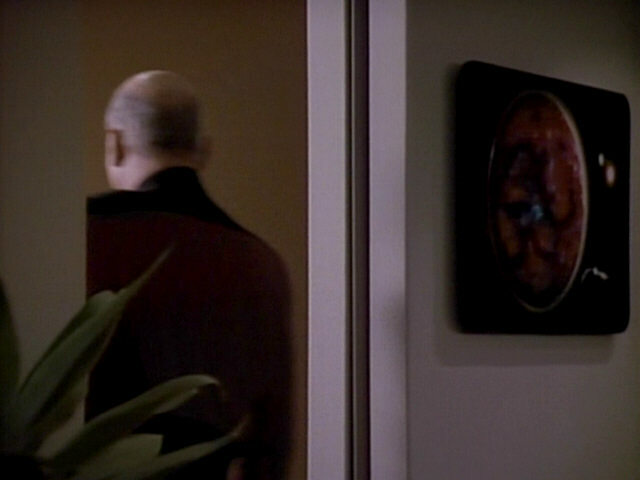 A good look at one of the space paintings in the observation lounge, created by Rick Sternbach. 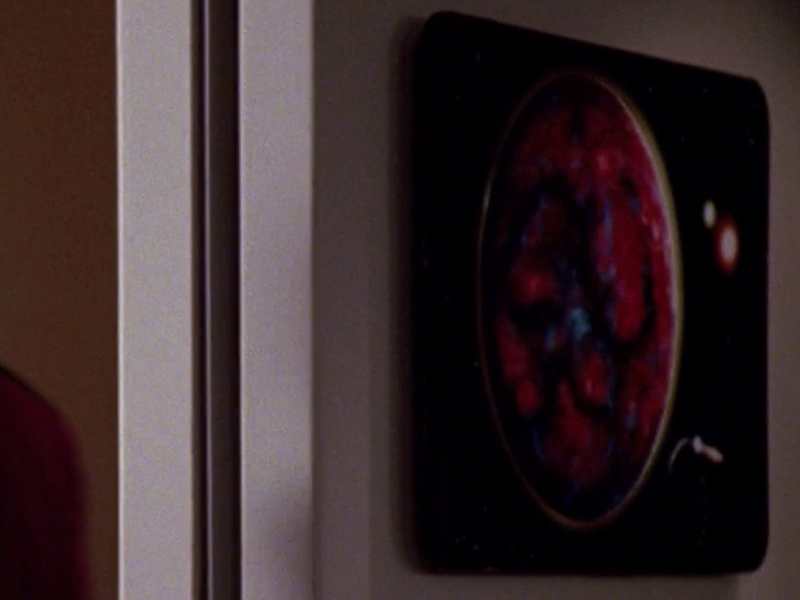 In the last three seasons, all these space paintings were replaced by different pieces of art. 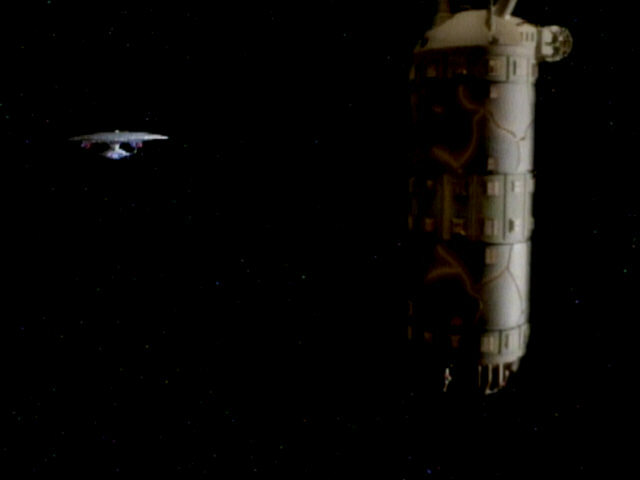 Space Art in Star Trek: The Next Generation An HD close-up of the painting. 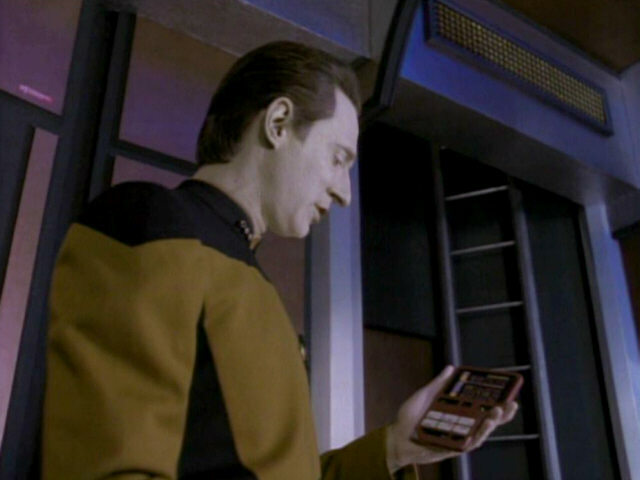 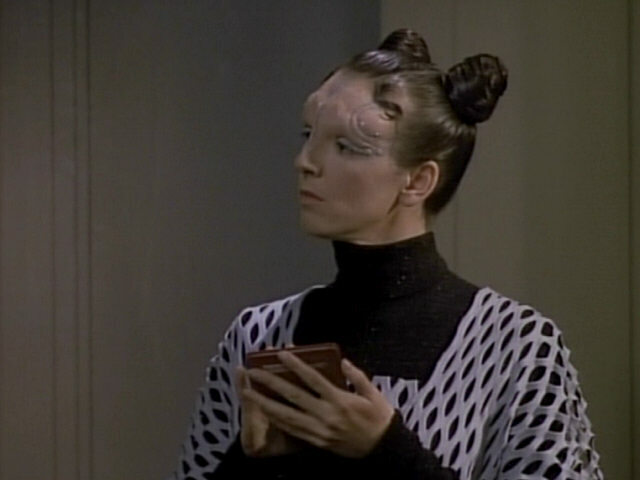 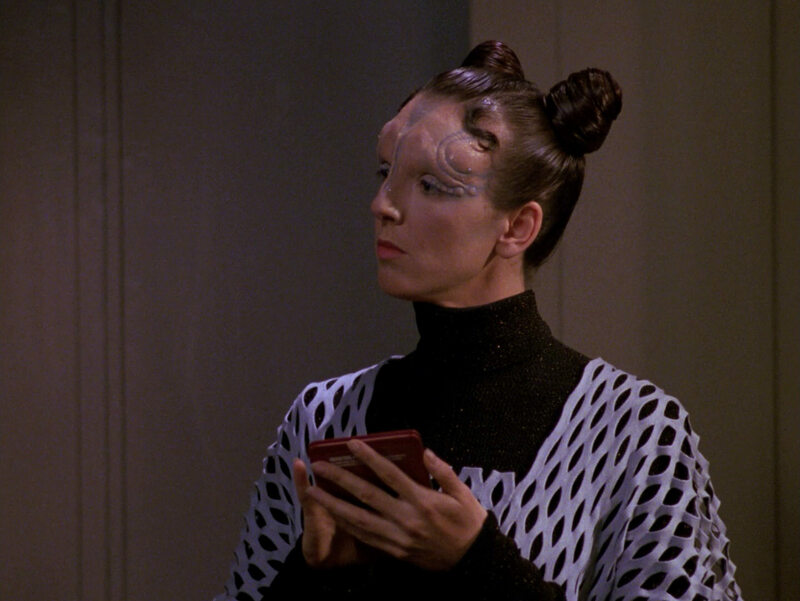 Nellen Tore is using a unique red PADD to take notes. 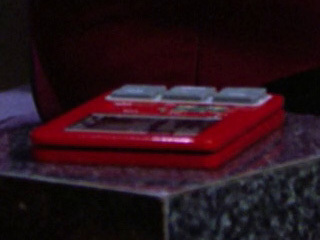 This echoes Dexter Remmick's red PADD he used in "Coming of Age" when interrogating people. 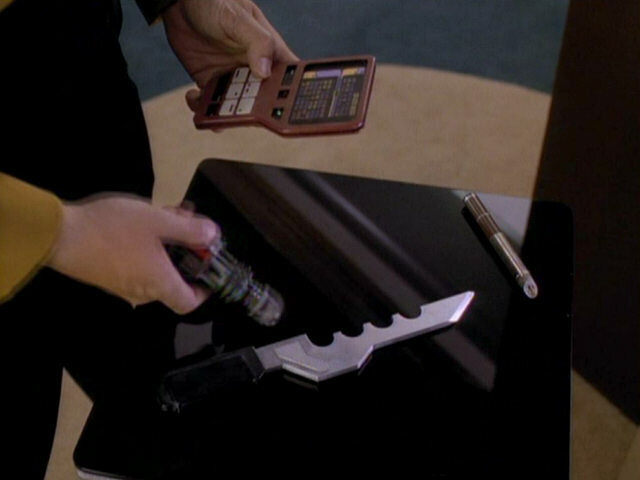 Both PADDs were later used by Geordi La Forge as engineering PADDs. 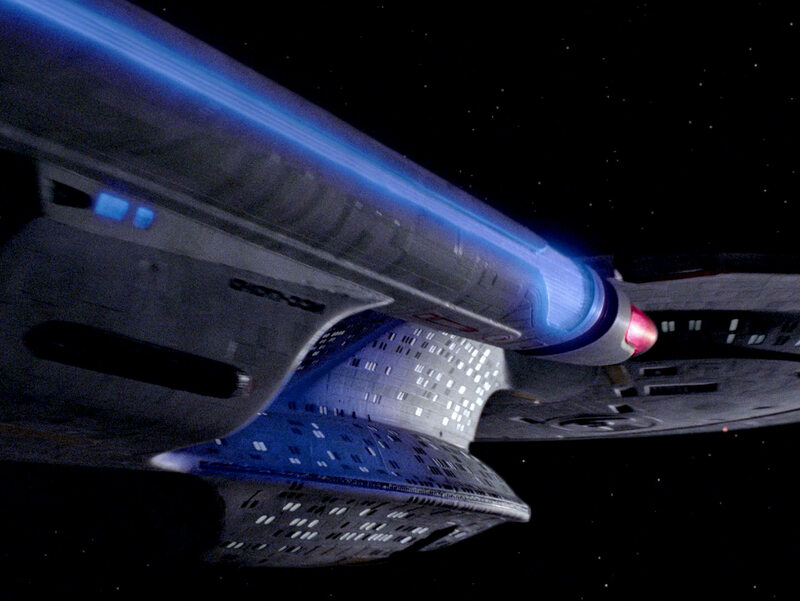 "Timescape" A better look at the prop in HD. 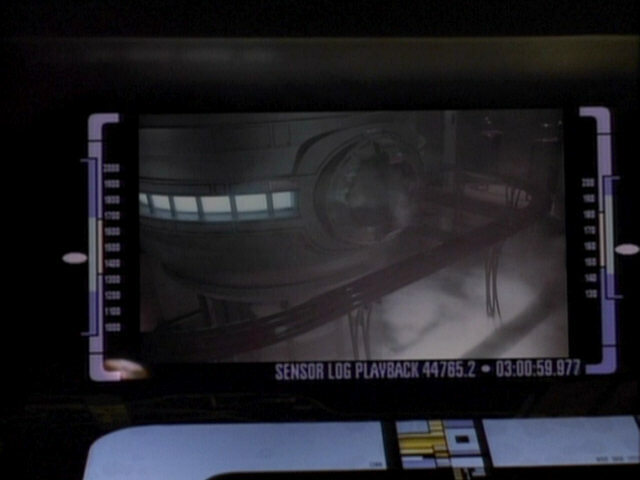 The footage of the USS Enterprise-D slowly approaching the camera was first seen in "The Loss" and appears for the second time here. 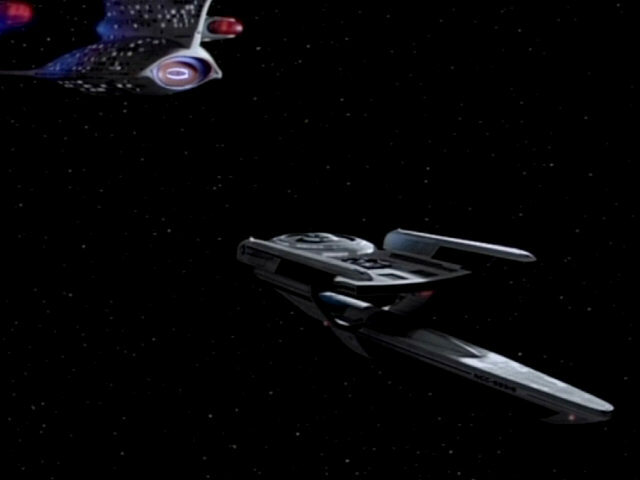 The shots of the ships in HD. 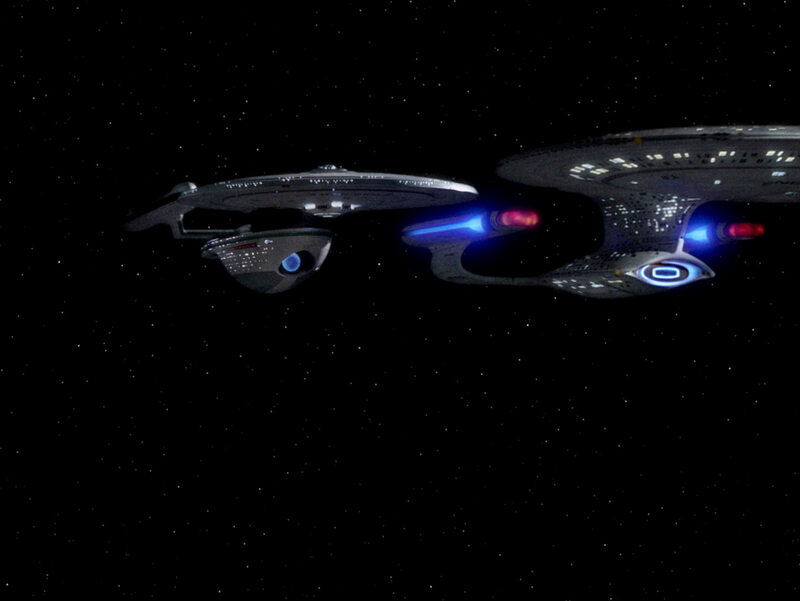 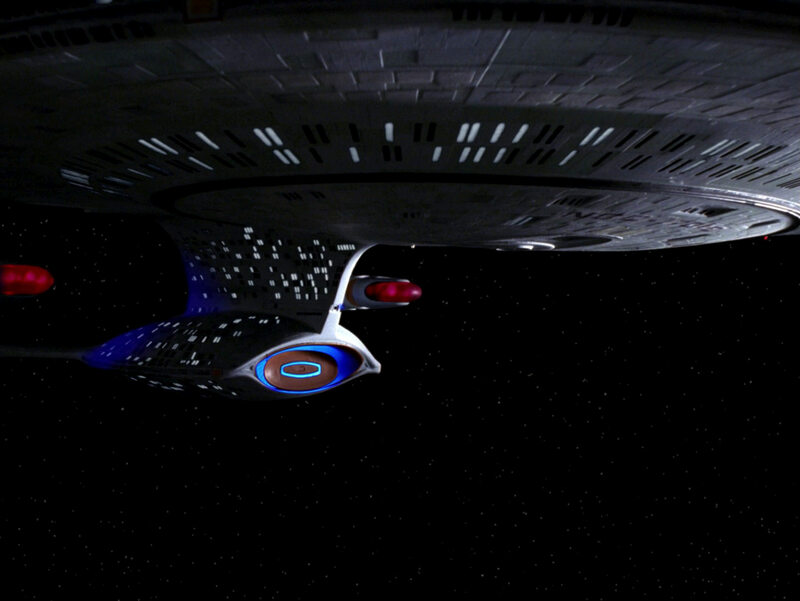 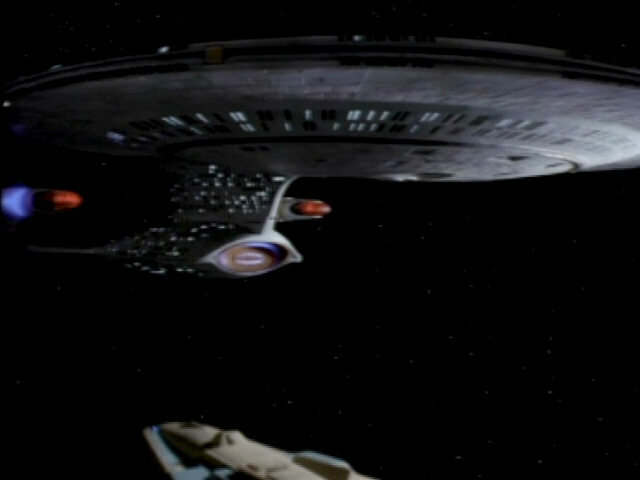 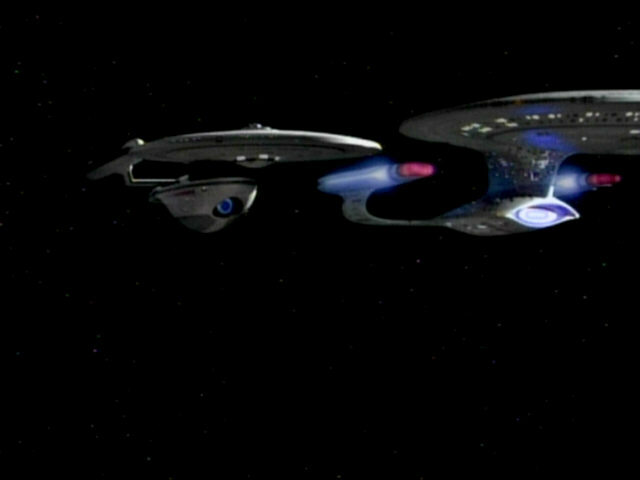 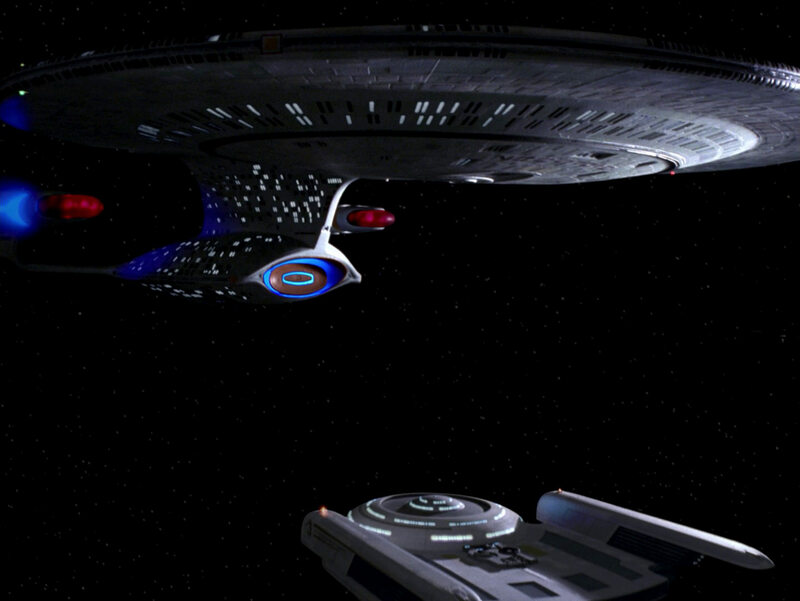 An unnamed Excelsior class-ship and the USS Enterprise-D part ways. 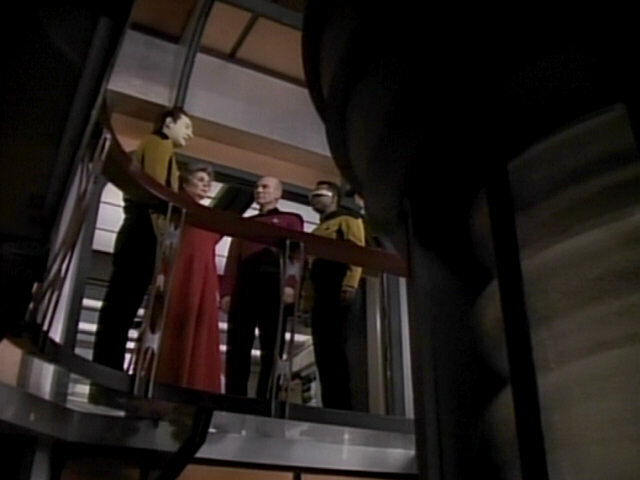 This is a re-use of the same sequence from "Tin Man". 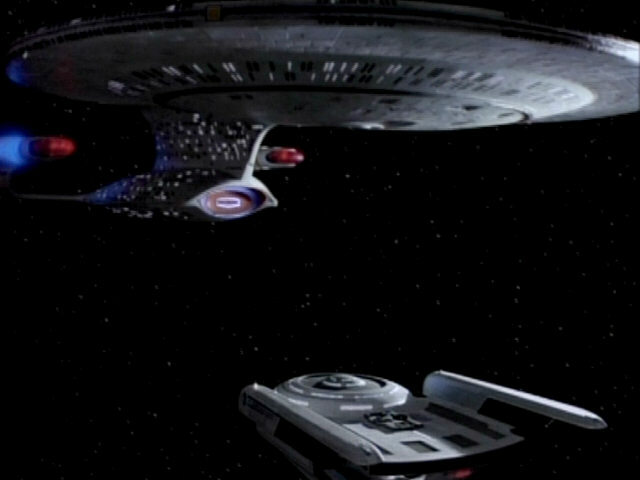 The footage of both ships was originally filmed for "Encounter at Farpoint" but was composited differently for "Tin Man". 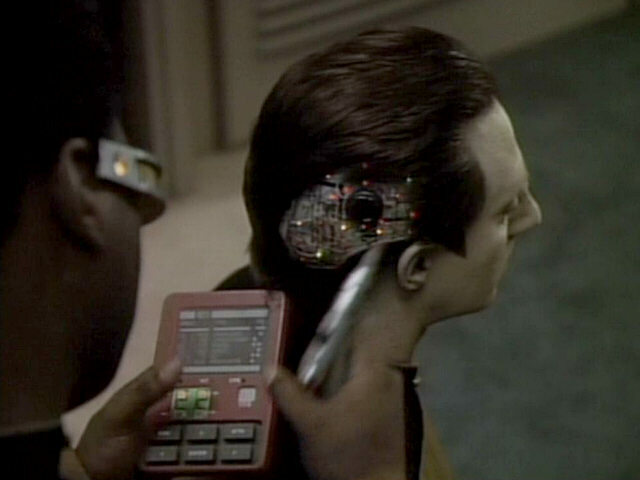 A look at the back side of the new interrogation PADD and Nelle Tore's alien make-up. 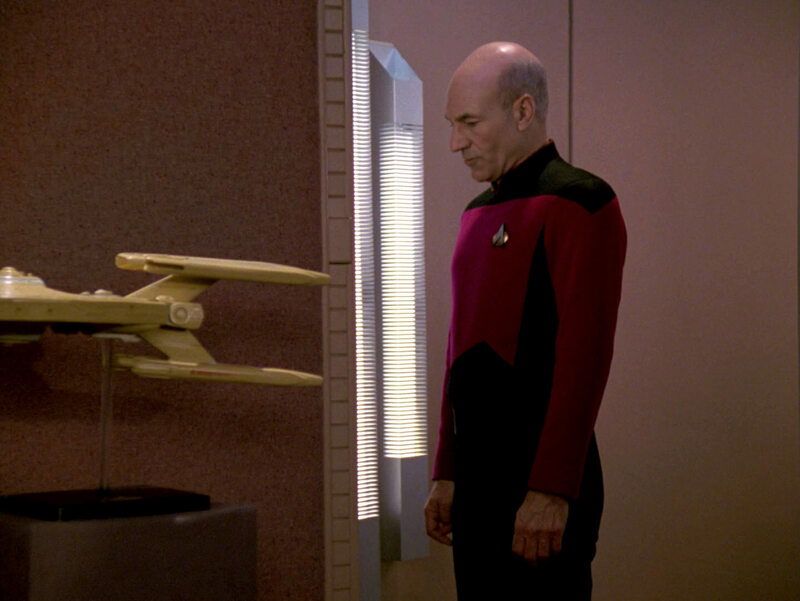 A better look at the prop and the make-up in HD. 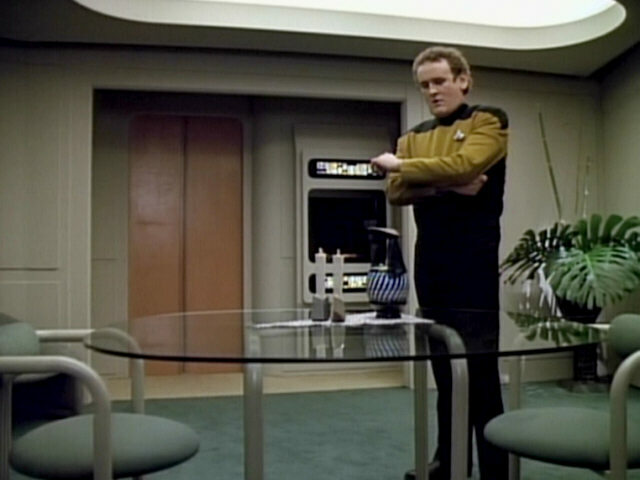 Admiral Thomas Henry leaves the interrogation room in disgust. 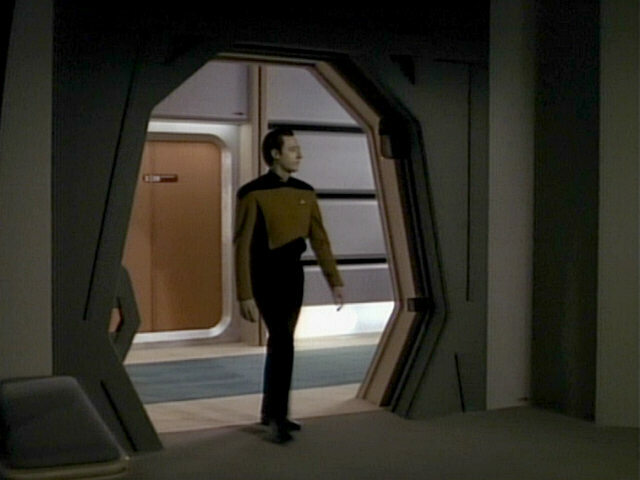 The rounded doors on the other side of the corridor prove that this set was not actually connected to the main corridor set. 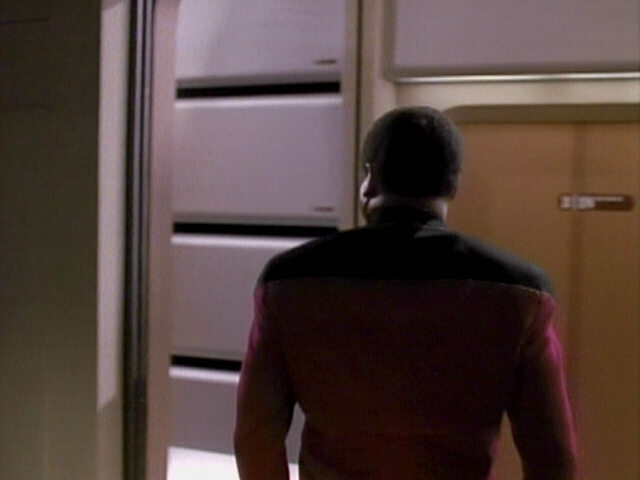 The wall featuring these doors was first seen in "Peak Performance" and also usually appeared behind the brig doors in earlier episodes. 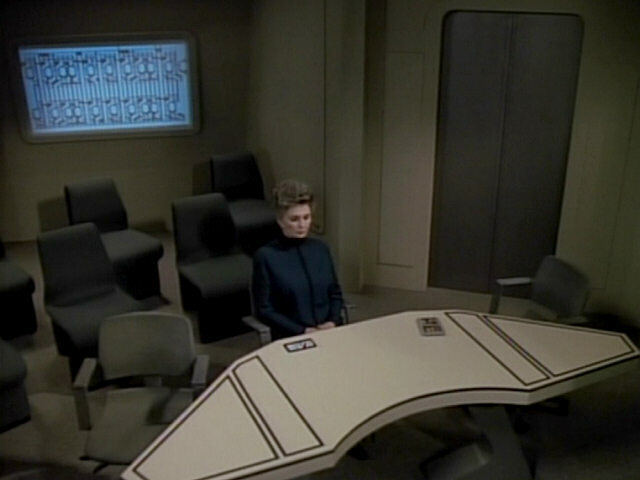 A last look at the empty interrogation room. 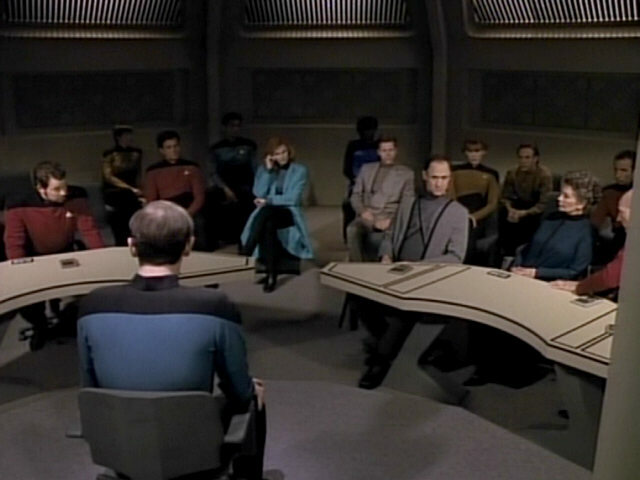 The characteristically shaped tables were also seen in the courtroom in "The Measure of a Man", though they were repainted in the meantime. 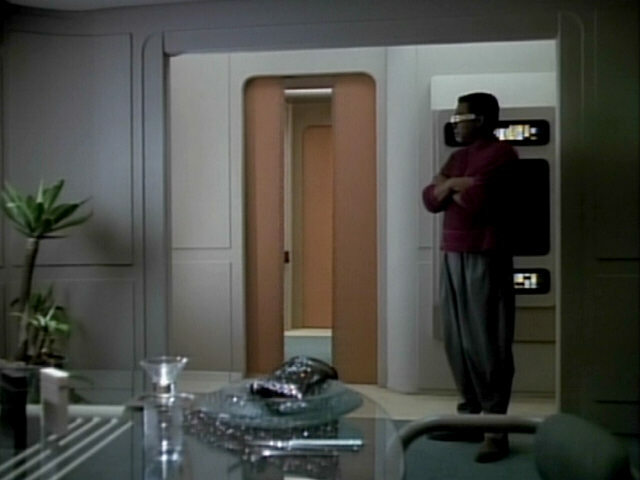 of a Man" The set as it looks in TNG-R.